data through 1979. A copy of this publication may be obtained by calling (301) 763-2502.
when orders fell 6.8 percent. March and a 9.8 percent increase in February. virtually all industries, durable and nondurable, were down. and miscellaneous durable goods industries reported increases. sharpest drop, down $1.0 billion or 4.8 percent to $19.4 billion. or nearly 4.0 percent declines. offset by declines in nearly all other categories. ratio has been averaging about 1.54 for the last year. scheduled for release on July 1, 1980. .0 ~ ~ ?~ 4 . 40 ~ ~ Ci CCC . 2' 8- T. C s "
C CC'- -3-- -- '- a~ : ? 0I I 4 4 -0 ! rr nmohu, h O 3.
o_ ____ ; S ,"
S .0) aC CC. S C .
. ... g- o r~ O / . -444 4n 44l "4 44 4~ 0 -1 ^. 3. '2 .0 141 010101 C "0..
"j ^. ji ? 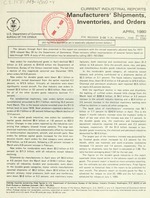 '"i'< ~ T .'a "
publication released in December 1976. U.S. BUREAU OF THE CENSUS. as well as the potential user of Census Bureau data. vidual copies, $0.25 each, except No. 4 ($0.30). more sent to one address. sender's risk; foreign currency is not acceptable.